Searching yields results for AMD processor PCs having boot problems, but I'm on an Intel and have no other noticeable symptoms. I'm on Win 10 Enterprise (1709 build 16299.125). Press Win, type programs, and select Add or remove programs. Clear the box for Internet Explorer 11. 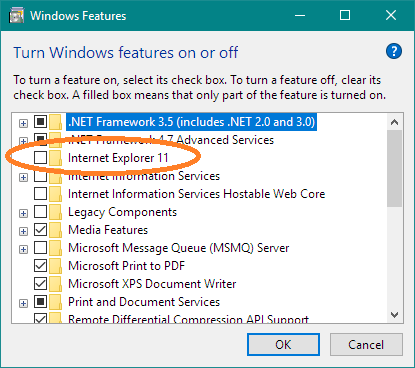 After uninstallation completes (reboot may be needed), check the box for Internet Explorer 11) and complete reinstallation. 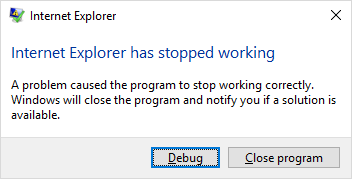 That said, IE11 is deprecated, and Microsoft would prefer you use Edge, , whether or not it meets your needs. Thanks to @Ramhound for walking me through the debug process where ieframe.dll was listed as one of the faulting modules. Not the answer you're looking for? Browse other questions tagged internet-explorer windows-10-v1709 patch meltdown spectre or ask your own question. If Spectre and Meltdown OS patches are not applied on a Windows system, can other new Microsoft patches be applied?